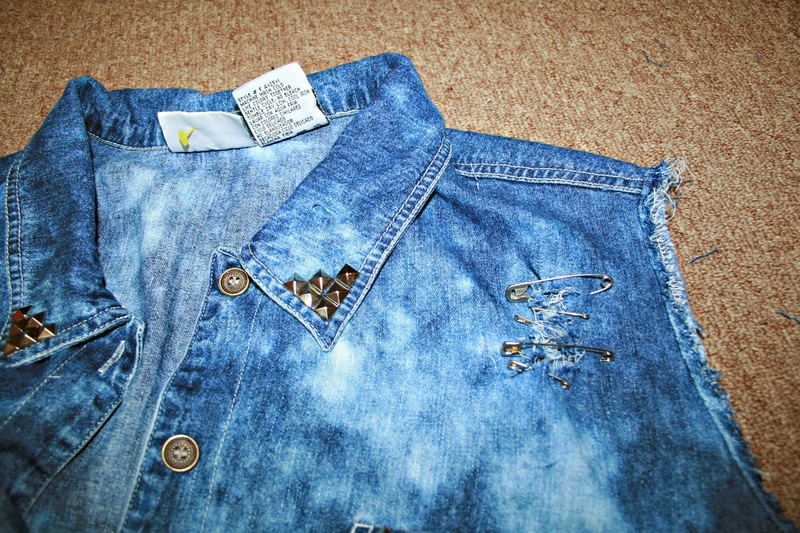 Have an old denim jacket laying around that you never wear? Tired of it sitting there looking all plain and boring? I know I do, and I've got a solution for that problem. It's D.I.Y time! 1. Make sure you are wearing old clothes since we will be working with Bleach. 2. Do this D.I.Y outside so you won't get the Bleach everywhere. It is also good to do it outside since it is a ventilated area. 3. 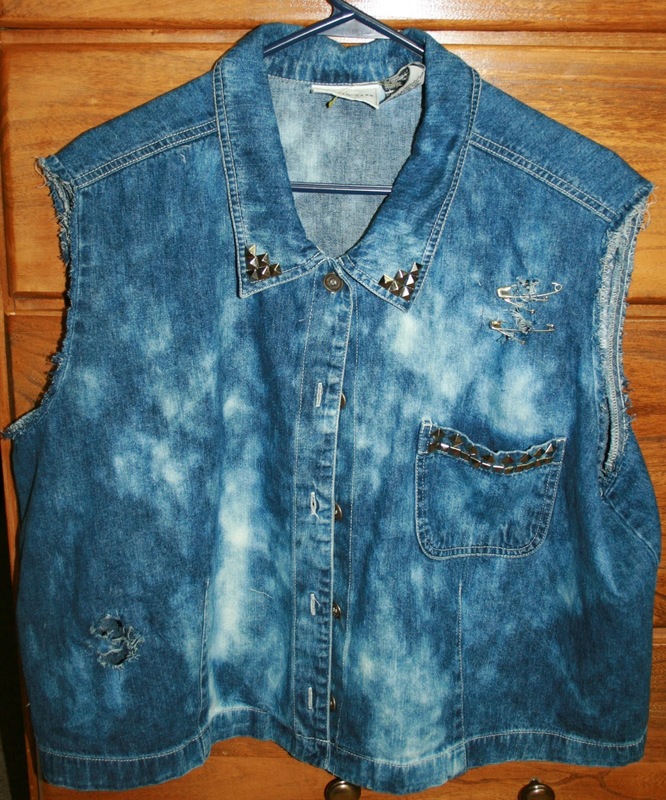 It really makes the vest look overall amazing if you add your own personal touches to it. 5. I would NOT recommend using the studs that you glue on. They won't be as secure when you have to wash your vest. I do recommend the studs with prongs though. I used studs from an old belt that I don't wear anymore. 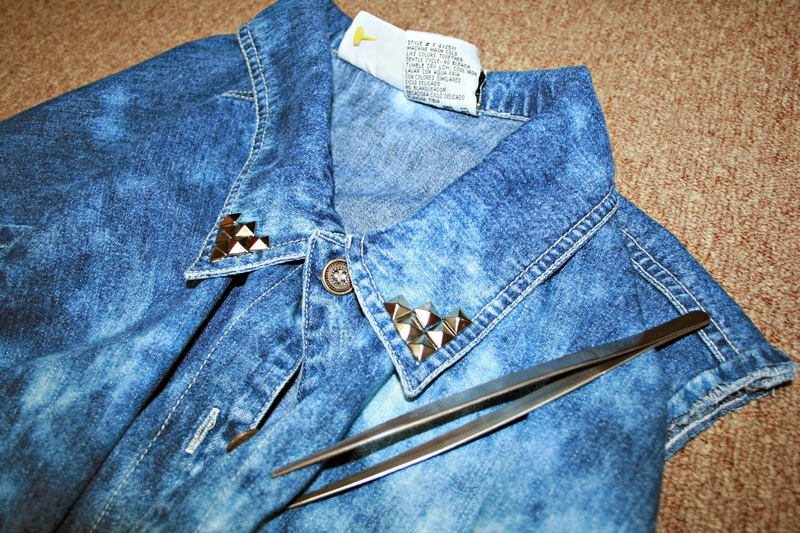 STEP 1: Pick an old denim jacket that you don't wear anymore. Maybe it looks boring. Maybe it looks too old for you. Whatever the reason, you'll need it for this D.I.Y. STEP 2: Make sure your jacket is completely wet. You will need to ring it out a little bit just so that it isn't dipping everywhere. Make sure it is good and wet though. STEP 3: Lay your jacket out on a flat surface in a well ventilated area. 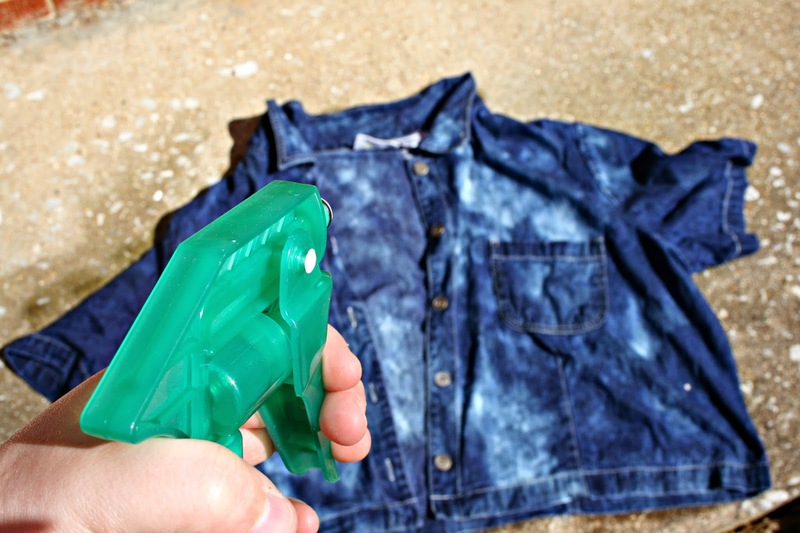 (outside is a perfect place) Fill up a spray bottle with Clorox (bleach) and spray your jacket sporadically. You can spray the bleach in any pattern you would like. Don't forget to spray the back of the jacket! 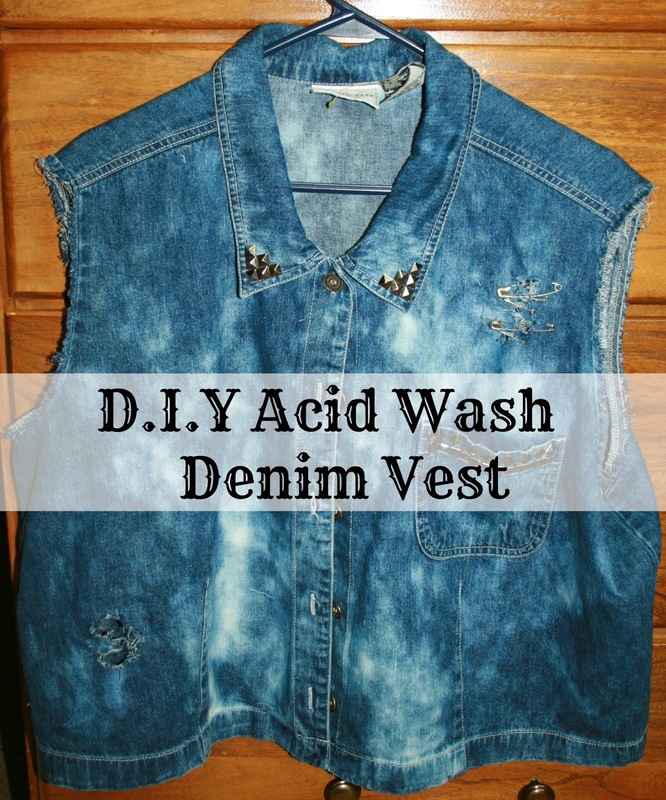 STEP 4: This is kind of an optional step, but you can leave the jacket sitting out for an hour and then spray some more to your liking. STEP 5: Toss that bad boy in the washer. Wash it alone and on cold. Then, stick it in the dryer, and viola! You're done! If you'd like to take your jacket a few steps further, then keep reading. 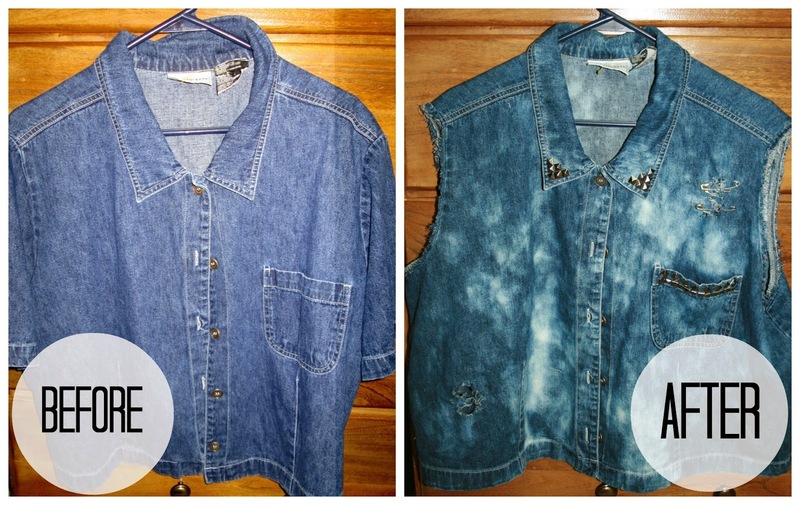 STEP 6: If you'd like to turn your jacket into a vest, just cut the sleeves off. 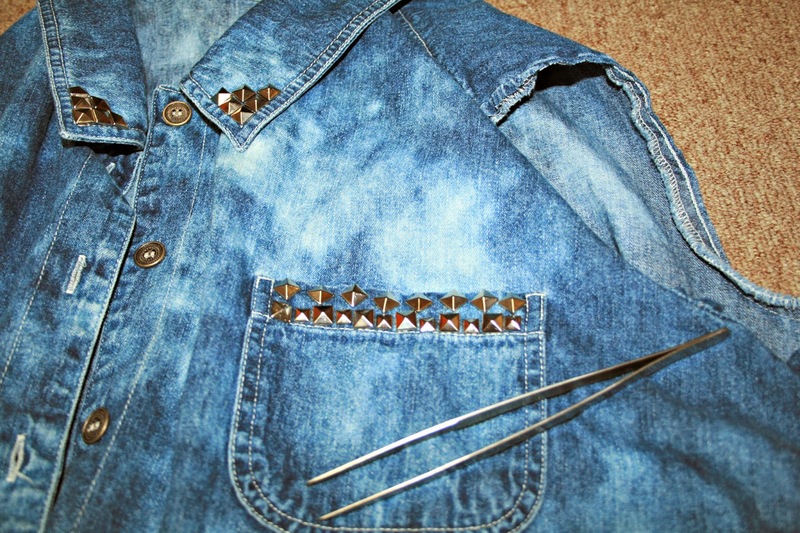 Then, use your pliers or tweezers and put your studs on your jacket in any pattern and anywhere you'd like. It's really up to you. The possibilities are literally endless! STEP 7: It's time to do some shredding and distressing! A razor blade is ideal when shredding denim, but all I had available to me wee my large tweezers and a pair of scissors. 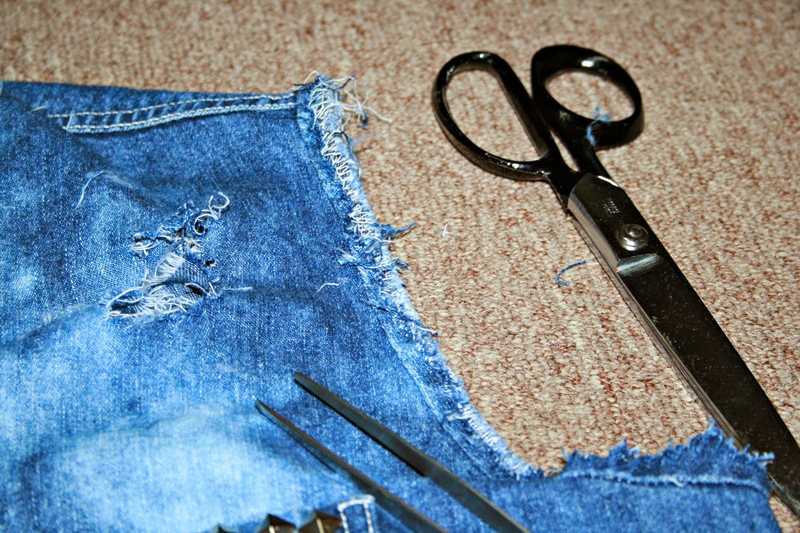 Take a pair of tweezers and pull out threads along the arm holes of the vest. Don't be afraid to be rough when distressing and fraying. I didn't make huge rips and shreds. You can make them as big or small as you'd like. Like I said before, this is YOURS. Customize it however you see fit. Unfortunately, I shred a hole in my jacket. YIKES! I made it wok though, which is always a cool bonus. I actually really like it too. Are you going to try this easy D.I.Y anytime soon? Let me know in the comments!